When I was a kid, I was excited about school getting out for about 5 milliseconds, then I immediately fell into a “What am I going to do all day?” despair. I didn’t know at the time that I wasn’t the only one who thought of summer as a season to “survive” rather than one that was inherently amazing. Maybe you’re trying to survive having kids home all day with you, maybe it’s keeping your parents distracted enough when they visit so that they don’t remember what a disappointment you are to them, maybe it is the overwhelming heat. There is plenty to do in and around Tulsa while you wait for football season to return or for Agents of S.H.I.E.L.D. to premiere. First, you can register for the National Day of Civic Hacking – Tulsa if you haven’t already. June 1st is covered! You could go on a Penguin Hunt. 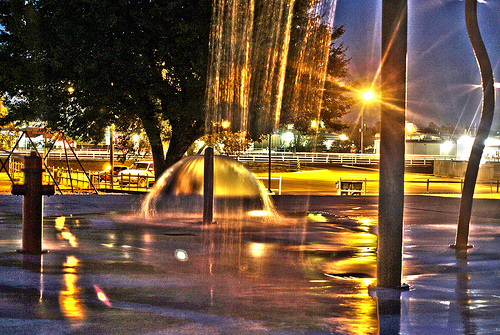 Or hang out in the water at Big Splash or LaFortune Park’s swimming pool. And, of course, participate in the Tulsa Library’s Summer Reading Program! Wiki your summer plans, and let the Wiki help you make some more plans! At the bottom of the page, there is an ‘Edit tags’ button. Add the ‘Summer’ tag, as well as any others that you think would be useful. Go to the Summer tag page and discover new parts of your town! And one more time, remember to register for the National Day of Civic Hacking – Tulsa !